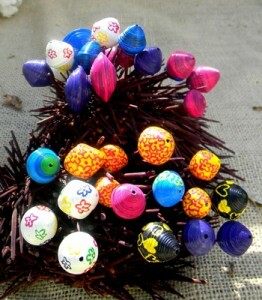 Home » Events and Experiences » Painted Paper Bead Swap! This may be kind of soon to ask, but when will the next bead swap be? If it’s not too late, please count me in the swap also! I’ll be waiting to hear from you. I already have my 16 beads all painted and ready to go. I would love to do this swap! I’d like to participate! Is it possible even if I live in France? 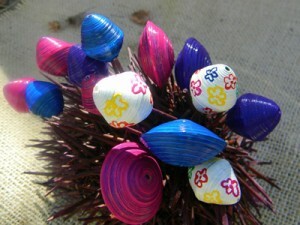 I just discovered paper beads and find it amazing. Count me in. I think after you see how many of us are participating it will be easier to decide how many beads to send. I’m excited and can’t wait. Thank you so much for all the hard work you and Kayla go through for us. I would love to participate in my first swap with you! Of course I’m in! Cant wait! Those designs on this page are so cute! Did you dip the paint with a round toothpick or very thin tipped brush to do those designs? Love Love Love It! Yea!!! Can’t wait to start painting . . . Now I have something to do with a bunch of acrylic paints someone gave me a while back!! Count me in! Trying to leave a comment again as having technical issues 🙂 It’s very exciting. great great great idea !! i already know what kind of beads i will make ! !